Professor Ruud Tromp gave the main lecture of the evening, in which he talked about careers for scientists outside academia. Tromp is affiliated with Leiden University but spends most of his time working at the Thomas J. Watson Research Center at IBM in the United States. He made the case that only a small percentage of PhD students makes it all the way to a professorship, while the vast majority has the ambition to actually follow this narrow career path. Most of them will inevitably end up somewhere else. With that in mind, Tromp argued that young researchers should also look into career options in industry, as there is a whole new world to discover outside of the relatively small academic scene. 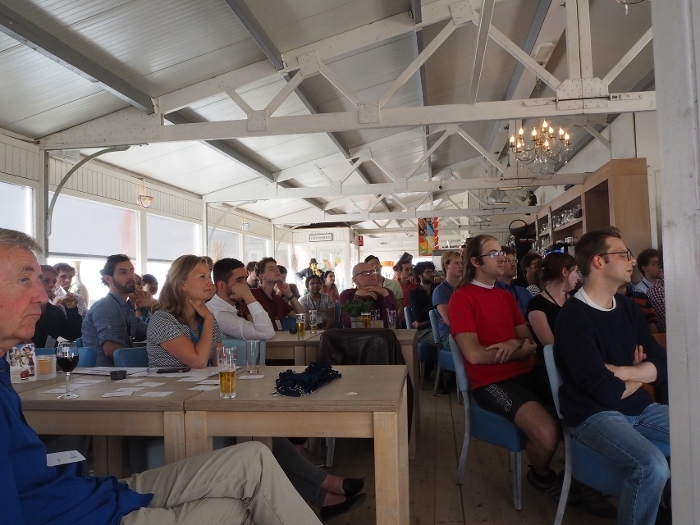 After the talk, Casimir—Leiden and Delft University’s joint research school in interdisciplinary physics—invited all attendees for informal discussions while enjoying a sunset beach barbecue.